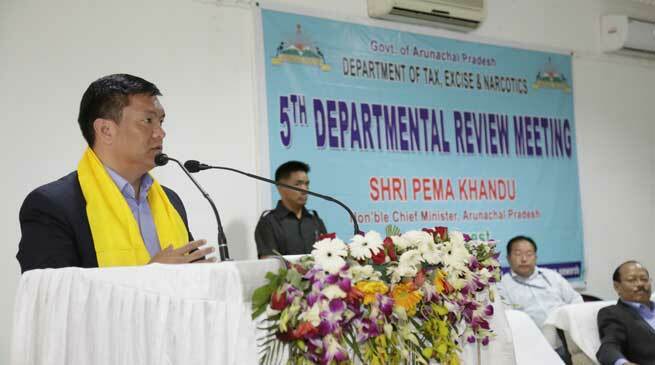 “GST, which is a destination based tax, will increase the tax revenue of a consumer state like Arunachal,” said Chief minister Pema Khandu on Thursday during the 5th departmental review meeting of Tax, Excise & Narcotics department. Further he said Arunachal will immensely benefit through Goods and Services Tax (GST) regime, which will be implemented across the country on July 1, . The Chief Minister who is also the Minister for Tax and Excise predicted huge jump in total revenue collection from the provisional figure 0f Rs 636 crore ( revenue generated both excise & tax ) for the financial year 2016-17. ” After implementation of GST , i am hopeful that we may cross Rs 1000 Cr including projected excise of Rs 250 Cr during this current financial year” said Mr Khandu. “94% of our state’s own resource comes through Tax and Excise department,” he said and appealed the department officials to gear up to work under the new tax regime so that they may contribute immensely in raising the taxation revenue of the government. He specifically urged them to work with the businessmen, to make them aware of the new taxation laws. “Tax and Excise department used to be labelled as corrupt department – but that will be a story of the past once the GST is implemented,” said Khandu and expressed confidence that GST will make business more transparent and the new tax system would end corruption to a great extent. He also spoke on several key challenges in successful implementation of GST in the state. “IT connectivity issues remain the biggest challenge,” said the Chief Minister, and pointed out that the state is facing great hindrances while preparing for IT infrastructure due to difficult terrain. Khandu informed that the state government has sought centre’s intervention for providing temporary IT facilities through VSAT services in remote locations where cable connectivity is difficult to reach at the earliest. Also to make the department efficient to implement GST, the Chief Minister assured on meeting manpower shortages that was highlighted by Tax and Excise Parliamentary Secretary, Tapak Taku in his speech earlier. Khandu announced that in the cabinet meeting to be held in May, he would approve for more post creations. The welcome address was delivered by Commissioner, Tax and Excise, Marnya Ete.